Picking a reliable hosting provider is often one of the most difficult parts of starting your own website. The purpose of this article is to offer a 1and1 vs GoDaddy comparison. We will be covering a variety of factors like security, usability, pricing, and the overall features of each provider. In the end, we will make a final recommendation regarding the best hosting provider between GoDaddy vs 1and1. One of the most important things to consider when researching a potential web hosting provider is the overall uptime and performance of the company you are interested in. Fortunately, this is an area where both 1and1 and GoDaddy both shine. As far as uptime is concerned, both providers guarantee 99 percent uptime. They both use several different types of redundant systems in data centers located all across the world. However, page load times are slightly different between the two choices. 1and1 advertises that their page load times are only 2.31 seconds compared to 3.31 seconds for GoDaddy. While both hosting providers are very reliable, 1and1 is the winner for the 1and1 vs GoDaddy performance comparison. For the sake of comparison, this section is going to be covering the shared Linux hosting plans of 1and1 and GoDaddy. It is important to note that both of these companies regularly run specials on their products for a year or more commitment period. 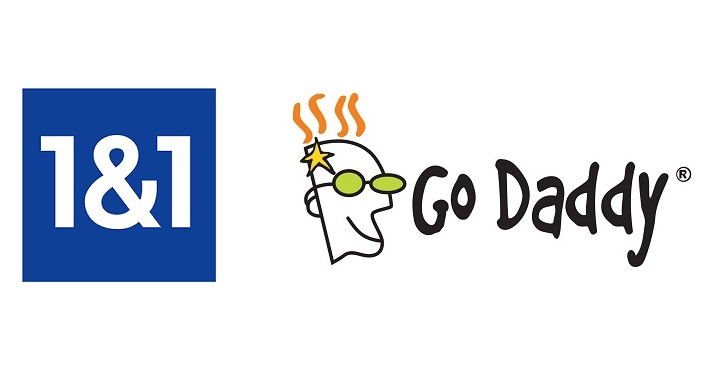 The three special plans currently for GoDaddy cost $3.49, $4.99, and $7.99 per month. The specials at 1and1 currently cost $0.99, $4.99, and $8.99. One thing worth mentioning is that the lowest level of 1and1 comes with an SSL certificate. You would have to get the highest plan to get one with GoDaddy. 1and1 offers more features for less money. The inclusion of an SSL certificate in all levels of the 1and1 hosting plans is a large plus for start-up e-commerce businesses. This makes 1and1 the winner of the features section. Both 1and1 and GoDaddy go to great lengths to ensure that their client’s websites are secured from a variety of cyber security risks. Both of the providers have invested heavily in infrastructure to help mitigate the risks associated with DDoS attacks and hacking attempts. In addition, both providers also have multiple data centers available that serve as backups in the event there is a cyber attack on your primary location. This helps ensure that you have access to your files when you need them most. Both providers also offer SSL certificates as well for businesses that process payments like e-commerce websites. Due to their inclusion of SSL certificates on all hosting plan levels, 1and1 is the winner of the security section. Both GoDaddy and 1and1 have worked to create hosting services that the average person can use with little to no coding experience. This is a great benefit for entrepreneurs who are looking to start their own online business who do not have the capital to invest in a professional web designer. To get access to this convenient feature, you will have to pay an additional cost for their perspective website builders. This amount averages around $4 a month depending on the given promotion. The overall winner is still 1and1. Their free templates are much easier to use and require a simple click to implement on your website. While both providers have done a great job making their services simple and easy to use, 1and1 is still the winner in terms of its usability. In terms of support and customer service, both GoDaddy and 1and1 do a great job making sure you can reach someone when you need them most. You can contact support for both providers 24/7 via phone, email, and a live support option. This is great news for those of you who may be new to web design and are afraid of getting stuck. Keep in mind, most types of support are going to be fairly standard. They can answer things like how to get to a given section of your account, how to configure name servers and other basic info. On the plus side, they can help you with installing popular plugins like Joomla and advise you on how to perform data backups. While both providers deliver excellent customer service, 1and1 comes out the winner here as well. 1and1 and GoDaddy are both excellent hosting providers. They each have outstanding customer support, reliable uptimes, and support a broad range of features that make them attractive options. However, 1and1 is the clear winner in terms of affordability. You can get much more bang for your buck with the lower level hosting plans. All of their plans come with SSL certificates, and you get over 500 email addresses with their most basic plan. While GoDaddy didn’t win compared to 1and1, see why it is a better service than Network Solutions. Feel free to share your thoughts and experiences regarding the GoDaddy vs 1and1 comparison.